Let me begin by playing a round of Two Truths and a Lie… We all know how this works, right? The speaker shares two truths about themselves, and a lie, but the lie must not be easily distinguished from the two truths, and the other players are supposed to guess which statement is a lie. So, here it goes: As a reader, I most often seek and yearn for poetry that is self-aware, but does not apologize. I want poetry that, to utilize a cliché, is honest to a fault. And I want poetry that physically makes me hurt: makes me cringe, makes me pause, makes me close the book for a hot second, makes my (again, cliché) chest hurt—we’ve all read those poems, right? But now here’s the trick: these are all true. Again, they are all true. This combination of elements in one poem, or one cumulative collection, is one I yearn for as a reader, and as a poet, but which I do not often see done, or done well. 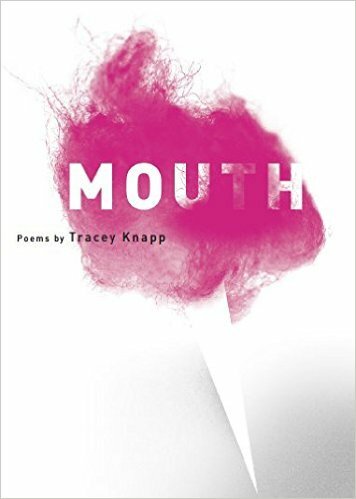 Tracey Knapp, in her debut collection, Mouth, performs these tasks beautifully. These poems are capable of being self-aware but unapologetic and far from self-important; they are honest, and overly, brutally honest at that; and they pull me out of my corner and face me with my own concerns, with my own hurts. And these poems are capable of doing this over and over, no matter how many times I read them. Undeniably what lures me so steeply into this poetry is Knapp’s unapologetic self-awareness and bluntness. Her persona is extremely realistic, logical, and unlike so many personas that point out their own faults or shortcomings, unapologetic. Continue reading my review of Mouth on The Rumpus . . .
TRACEY KNAPP works in graphic design and communications in San Francisco. She received graduate degrees in creative writing and English from Boston University and Ohio University, where she taught literature, composition and creative writing. She has received scholarships from The Tin House Writers’ Workshop and The Dorothy Rosenberg Poetry Fund. Mouth is her first full-length collection. Previous Poem in this year’s The Spooklet! Next Tracey Knapp Reading at IU South Bend Tomorrow!